Time to set my goals for the second quarter Finish-A-Long. I did finish one of my quilty goals from 1st quarter, but then forgot to link it up to the linky party. That’s ok though. A finish is still a finish and worth celebrating! I finished this quilt that was part of a design and challenge that I did for Quilt Design a Day. You can read about it here. Last quarter we talked about making your goals SMART – specific, measurable, achievable, realistic, & trackable. You’re more likely to reach those goals and less likely to get sidetracked with extra stuff when you do that. My goals are specific, measurable, and trackable. However, they are probably not realistic or achievable in that I don’t think they will all be finished in the next 3 months, but maybe by the end of the year. So, yes, I will still call them goals. I had the wonderful opportunity to attend QuiltCon in February, and now I have a whole other list of other quilty goals – designing, teaching, learning, etc. – to work on. But that’s for another day. Today is about the quilts I need to finish as part of the Finish-A-Long. Finish improv quilt. About 1/3 – 1/2 done with piecing top. It’s improve. No real plan, so I really won’t know it’s finished until it tells me. These blocks need to be joined into a quilt top, then backed, sandwiched, quilted and bound. Finish Hoopsisters Mystery 201? quilt. About 12 blocks done. Need to finish all blocks, then put together, and bind. I have 80+ of these blocks that need to be turned into a quilt. And a new quilt that I started… Finish this rainbow quilt. Top is done. You are seeing just a small part of it. It needs to be sandwiched, quilted, and bound. Wow! This list is a bit overwhelming. These are not all my UFO’s, but they are the ones I could easily put my hands on. And it’s ok if I don’t finish them all. But at least they are now on my radar. They are written down, and now I am more likely to finish them. Of course there are other items on my list. I have several bee blocks to do. I’m still working on Splendid Sampler blocks. I am working on designing several blocks and quilts. And I am doing the Riley Blake Creative Rockstar challenge. Since tax season is almost over, maybe I can get more than one of these quilts finished this quarter. That would be nice. Although the garden is calling… So, maybe not. What are your goals? Write them down. Make them SMART (specific, measurable, achievable, realistic, & trackable) and let’s see how much you can achieve! Linking up with 2017 FAL – Q2 at She Can Quilt. Here I am setting my goals for the first quarter Finish-A-Long. I did this last year and actually finished 6 of the 8 items that were on my list. I would call that a SUCCESS! It’s a great example of how making your goals SMART (specific, measurable, achievable, realistic, & trackable) makes them more easily reached. When you write your goals down, and if you can attach a picture to it, it’s more likely that you’ll actually meet that goal. Finish improv quilt. About 1/3 – 1/2 done with piecing top. Of course there are other items on my list. I have several bee blocks to do. I’m still working on Splendid Sampler blocks. I am working on designing several block and quilts. And I’m studying for my real estate license and it’s tax season. So, no I’m definitely not going to get all this done. But if I can mark at least 2 items off, I’ll feel good about it. By the way, the reason I’m aiming for 2 finishes instead of 1 is because I have one that is almost done. I just need to finish the binding and that shouldn’t take more than an hour or so. So hopefully I can finish another in addition to that one. Is that cheating? Definitely not! And maybe I’ll surprise myself and finish more. So what are your goals? Write them down. Make them SMART (specific, measurable, achievable, realistic, & trackable) and let’s see how much you can achieve! Linking up with Rhonda’s Ramblings. 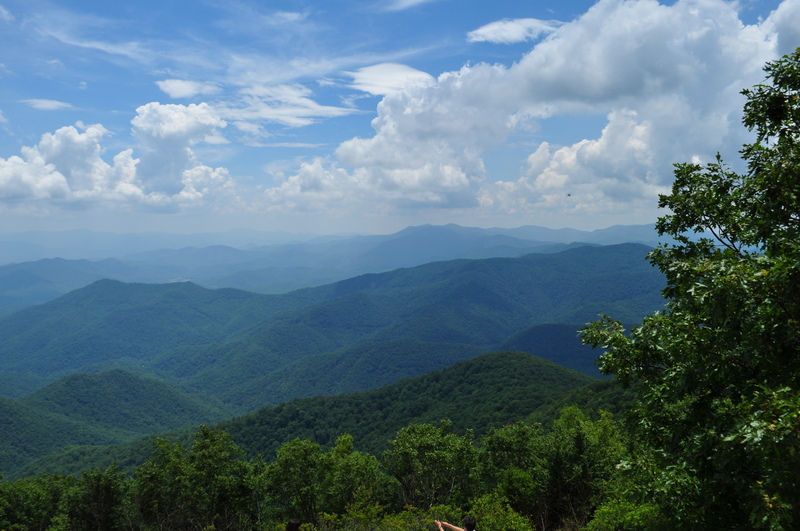 It’s been 4 weeks since we moved into my parents house in the mountains of NC. Four weeks since I’ve not had to get up to go to work, get up to work on the house, or get up to pack all our personal belongings. Four weeks to rest, relax, and do whatever I feel like doing that day. It has been a wonderful four weeks that have passed much too quickly. 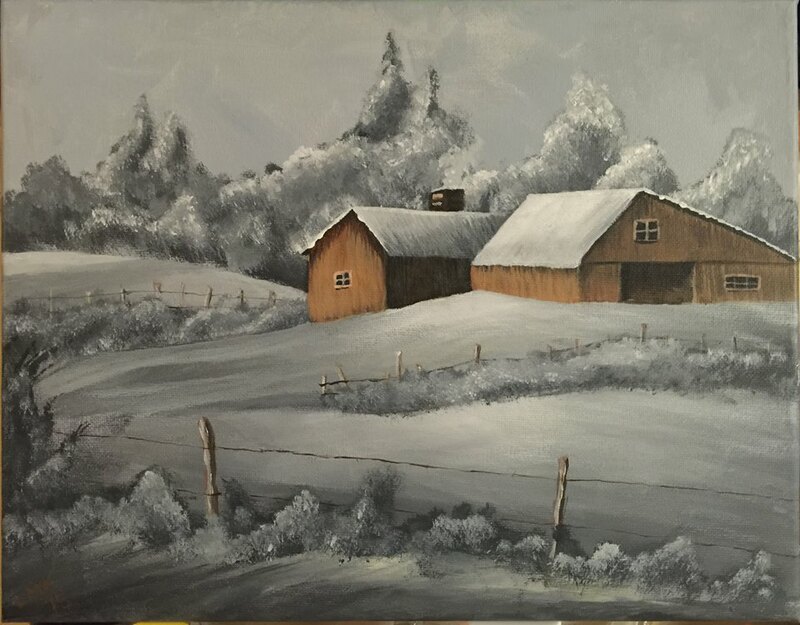 I have spent time with family, enjoyed the scenery, slept more than I thought possible, cooked more than I have in years, and taken up painting with acrylics. I’ve also made a new friend, saw the Independence Day fireworks, sampled some Shepherd’s Pie at the local Taste of Scotland festival, digitized some new embroidery files, supported two benefit breakfast fundraisers, investigated two businesses for sale, attended my mother’s choir concert, and attended the very first meeting of the Smoky Mountain Modern Quilt Guild. But I feel like I’ve not been very productive. In one way, I feel like that should be O.K.. I’ve spent 10 years working 60-hours per week on average. I spent most days racing from one thing to another, fitting in whatever I could between working hours. And many things just never got done. After 10 years, I needed to destress and relax some, for both my physical and my mental health. And that’s what I’ve been doing for the past 4 weeks. But you know that list of things you keep in your head that you want to do should you have time one day? That list of things you always dreamed about doing whenever you’re stuck at the office 14-hours and don’t have time to do anything other than work that day? Well, that one day is here and I don’t know what to do. Shouldn’t I be doing and marking things off that list? I think I should be. But, what were those things/items/goals on my list again? I’m sure there is more I would like to accomplish in the next few weeks/months, but I need to be realistic in the goals I set as well. So, this will do me for now. Do you have goals that you set each day/week/month/year? Do you write them down, or does the list reside only in your brain? I know I need to get better at writing things down so that when I do have extra time here and there, I’m not sitting around wandering what to do. Historically, I tend to be much more productive if I have a game plan instead of trying to wing-it on a daily basis. Does it work that way for you too? Linking up with Adrianne at One The Windy Side for 2015 Finish Along Q3. Let me be very upfront about this. I don’t like New Year’s Resolutions. I honestly do not think I have ever seen anyone, and I mean ANYONE, keep or live up to their New Year’s resolution. I see it only as a way to let yourself down. However, I do believe in setting goals. In fact, to quote a well-known financial guru, “if you fail to plan, you plan to fail.” Plans and goals are essential. Otherwise, you live day in and day out with no direction; and without direction, in 10-years, you’re likely to be exactly where you are now. Very seldom does want you want come easy. It usually takes hard work and dedication. But what are you going to work towards if you don’t know where it is you want to be. Setting goals will give you that direction. Your goals need to be SMART – specific, measurable, attainable, realistic, and time-sensitive. 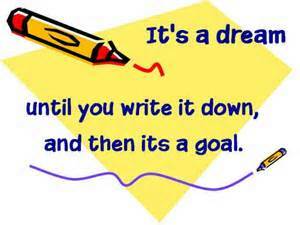 And goal setting can happen at any time, not just on the first day of each year. So here are some of my short-term goals. Improve my free motion quilting skills. I plan to follow the examples provided by The Free Motion Quilting Project at http://freemotionquilting.blogspot.com/. I will likely do something similar to her Batik Beauty Quilt. Make a tree skirt. I have a picture of one in my head that is ice blue and white, with embroidered snowflakes. Determine what I plan to make to take to the fair. I enter projects each year in the NC State Fair. The challenge, and the competition, is thrilling. I would be very interested in a quilting challenge now that the monthly challenges through Art Gallery Fabrics have ended. However, other than the Hoffman fabric challenge, I can’t find one that isn’t already so far along. I’ll look again closer to summer time. Exercise 5 hours a week. Stay on a budget every month.